HI, this is beautiful!! <3 it. ooooo!! soo pretty!!! you should do more looks with videos! Wow this is gorgeous so very tropical love it ! This is beyond gorgeous , I absolutely love it!! Looks so pretty! 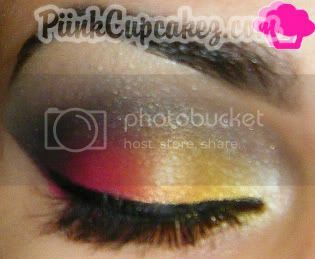 Love the blending! Great tutorial! I love you eye makeup here. Lovely blog btw. Hope you could follow and check out my blog as well! i love - very pretty!!!! not sure i could pull this off but it looks wonderful on you! I love this look! and love your blogs! & thanks for the slide show tutorial! i'm def. going to try it! gorgeous look! You are so talented!!! love! !